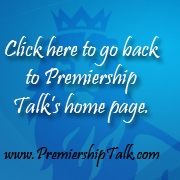 Welcome to the Premiership Talk Forum! All you need to know regarding both the forum and the main page! Feel free to come here and help is improve either the forum or main site! New member? Come here to say hello and introduce yourself before posting! Talk about any other sports that interest you! Casual chat with no real boundaries, Come and let go here!